In a series of victories for civil disobedience rights on Thursday, May 31 the U.S. Attorney’s Office (USAO) dropped charges and dismissed several cases against people involved with the #DisruptJ20 march during President Donald Trump’s inauguration, and a federal judge sanctioned prosecutors for lying about evidence. Although a jury found the first group of protesters not guilty of all charges in December, federal prosecutors have continued pursuing cases against 59 of the rounded-up demonstrators—trying them in groups, seeking to imprison them for decades on felony charges, and relying heavily on recordings by the right-wing activist group Project Veritas. Following a revelation last week that “prosecutors suppressed potentially exculpatory evidence,” known as a Brady violation, it was revealed in an overnight filing by defense attorneys that the government concealed 69 Project Veritas audio and video files and altered other recordings. In response to the new Brady violations, at a pre-trial hearing on Thursday, Superior Court Judge Robert Morin dismissed conspiracy charges with prejudice—meaning that they cannot be refiled—but dismissed lesser charges without prejudice, meaning the government can still pursue those, according to reporters from the Huffington Post and Unicorn Riot. 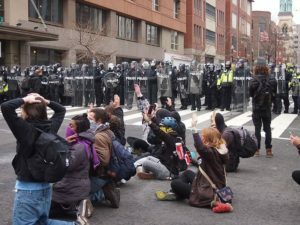 Morin’s rulings Thursday apply to the May 29 trial group, the third group of J20 protesters—and reportedly led the USAO to dismiss several other cases, including the June 4 group. On May 1st, International Workers Day, people from all over the world demonstrated in the name of rights for all workers, all over the world. Some of the demands included a living wage, rights for all workers in and outside of the workplace, equality for incarcerated workers, an end to deportations and ICE raids, the right to unionize, stop the eviction crisis, fully funded public schools, an end to the school-prison pipeline, and many more! 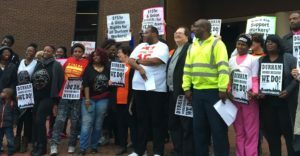 In Durham, the May Day rally, was organized by the Durham Workers Assembly, a group of organizers and union members, who strive to unite all working class people, demand rights in the workplace, and turn Durham into a union town! The rally and march was also sponsored by many other local organizations, including SEIU, UE 150, Socialist party USA, Workers World Party, and the IWW. The marchers, largely made up of Black and brown, working class folks, met up at the Durham Police Department, where they held up their signs reading “Workers Day, $15/hr and unions for all, end Ice Raids” and “Abolish Capitalism, fight injustice, Build a Workers World”. The rallies then marched to the new Police department, chanting “we work, we sweat, throw 15 on our check” and “the workers, united, will never be divided”. 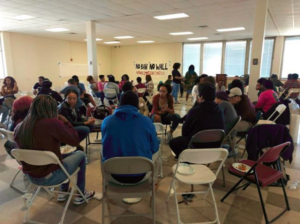 Following the gathering at the new police headquarters, many activist, union members, teachers, and others, spoke on the ways in which they want to see the living and working qualities in Durham change. By request of the Fight for 15 organizers, they then marched to a local McDonald’s and had more speakers demand $15 and hour and an end to oppression in the workplace. May 16: Teacher-Student March on Raleigh! #GetReady educators, parents, public school supporters & advocates! We will be marching for students the morning of May 16th from NCAE Headquarters to the General Assembly to greet lawmakers on opening day. We will meet no later than 10 a.m. at NCAE HQ, 700 S. Salisbury St. We will end the day at 3:30 p.m. with a Rally for Respect. North Carolina is one of the worst in the country in the amount our elected leaders spend per student, more than $3,000 behind the national average. Imagine what $3,000 per student could mean for our children. However, we have the lowest corporate tax rate in the country for states that have one–and it’s set to go lower again. North Carolina ranks 35th for teacher pay, about $9,000 behind the national average. When adjusting for inflation, educators are losing money(almost 12 percent)—the third worst rate in the country. Our students deserve better. They deserve the resources to help make them successful. They deserve professionally paid educators. They deserve safe schools and schools that are not crumbling and in disrepair. We love our public schools and we demand better! On May 16, we march for students, we rally for respect, and we advocate for public schools. As you know, we recognize #Red4Ed on Wednesdays. Let’s have a sea of #Red4Ed on Jones Street on May 16. On Wednesday, February 20th we received the wonderful news that remaining charges against the freedom fighters who toppled the Confederate statue on 200 E Main were dropped. While there are still activists fighting charges around the statue takedown and we pledge to continue fighting for them, the people’s political pressure enabled us to win a historic victory in the fight against white supremacy. Are you a middle or high school student planning a walk out at your school on March 14? Join us on this planning call! 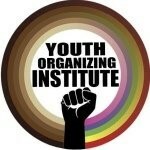 Hear , Get helpful tips regarding your rights and hear from other students who have planned actions at their schools by contacting YOI here! On February 14, 2018, one of the largest school shootings in the US occurred in Florida, leaving 17 High School students and teachers dead at the hands of a 19 year-old white male shooter. We mourn for the lives lost, we hold the community of Parkland, Fl in our thoughts, and we stand in solidarity with the brave survivors fighting for safer schools. We support these students’ efforts in advocating for better gun control and putting an end to gun violence in schools. We also believe it is important to broaden the conversation around what violence in schools looks like. Join youth, students, and their families for a speak out at the Wake County Public Schools Board Meeting on Tuesday, March 6 against violence in our schools — from mass shootings to armed School Resource officers, exclusionary curriculum to underfunded counselors, and more. We customize our workshops for particular organizational needs – education, social work, social justice activism, interfaith relations, etc. Our typical workshop is approximately three-hours in duration and is ideal for 30 – 50 participants (customizable based on size of organization and needs). This workshop utilizes pictures/graphs, short videos and interactive exercises. More than sharing information, MERI believes in taking practical actions to defeat Islamophobia and racism. 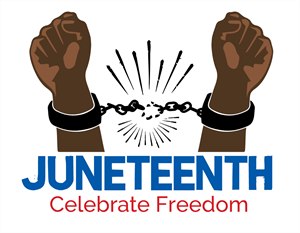 We will identify practical steps to be taken to organize against these oppressions. We will provide examples of solidarity actions, information about upcoming events and other resources to allow long-term actions in defeating Islamophobia and racism. MERI workshops on Islamophobia are facilitated by People of Color and Muslim presenters. These workshops offer interactive sessions to allow understanding about Islamophobia and learn from participants’ experience. Resources generated from these workshops support anti-Islamophobia work by grassroots organizers in People of Color and Muslim communities. Conference organizers are thrilled to announce that Dr. Nolan L. Cabrera, an award-winning scholar and Associate Professor in the Center for the Study of Higher Education at the University of Arizona, will be delivering the keynote address. Dr. Cabrera will be speaking on the Tucson Unified School District and the fight for Mexican American Studies. He is heavily involved with the case where the U.S. District Court ruled that school officials’ “racial animus” motivated shutting down the ethnic studies curriculum. Come learn about how the courses positively impacted students’ educational experiences and how to fight for ethnic studies in your local district. 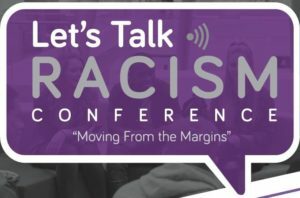 The conference registration fee is $40.00 and $20.00 for students. 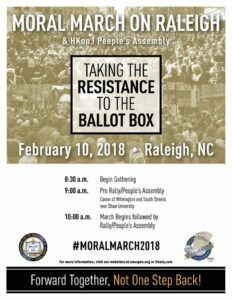 This event is co-sponsored by we are (working to extend anti-racist education), North Carolina Central University’s School of Education, the Samuel DuBois Cook Center on Social Equity at Duke University, and Ben & Jerry’s of Chapel Hill. Visit we are’s website, www.weare-nc.org, for additional information. Join Inside-Outside Alliance to write letters to our comrades on the inside. We invite everyone who hates prisons and loves prisoners to join us. We will have a letter writing list, stamps, envelopes, and copies of the “Feedback” newsletter to send in. Feedback is composed of writing, letters, stories, and poetry from detainees in the Durham County Jail. On August 14, 2017 Durham residents took down the supremacist Confederate soldier statue in front of the Durham Courthouse. This occurred just two days after Nazi’s and KKK rallied in a “Unite the Right” rally in Charlottesville, VA to defend Confederate statues and killed an anti-racist protester, Heather Heyer. The Durham action was another powerful expression of people’s anger and disgust with how the system uses its power to remind Black, Brown and oppressed people of their “place” and ongoing oppression and exploitation. After Heather Heyer’s murder by white supremacists in Charlottesville in August, Confederate flag sales quadrupled. In Durham, people took the Confederate monument down themselves – demonstrating that many feel they should take matters into their own hands when governments attempt to stop progressive social change. In 2015, the Republican-dominated NC State Legislature passed a bill that took away authority from local city and county governments to remove Confederate statues from their property, GS § 100-2.1. This is the same state Legislature that the US Supreme Court ruled gerrymandered voting districts based on race with “laser-like precision”. The state Legislature also passed similar legislation – HB2 — that eliminated local governments’ power to protect transgender people from hate crimes, or enact protections for workers from abusive employers, like raising the minimum wage and improving working conditions for contractors. After countless court dates where Durham activist and community members showed up in front of the Durham County Courthouse to support the arrestees for their brave actions, the state has decided to take the 8 freedom fighters to trial. Supporters are demanding all charges be dropped and all confederate monuments be taken down immediately. 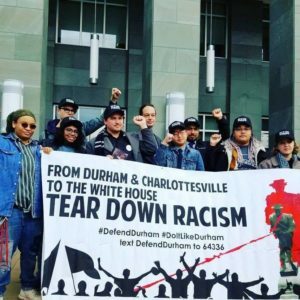 Defend Durham and the arrestees are asking for supporters to show up to the Durham County Courthouse, on February 19th, while they face charges for challenging white supremacy and toppling racist monuments. 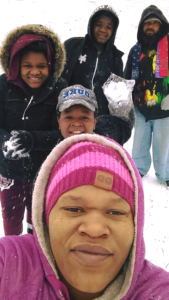 Pictured above is Elijah’s family. He is one of the arrestees from the anti-Klan demonstration in Durham on August 18, 2017. Elijah’s landlord has refused to extend his lease because he was arrested in the Confederate statue toppling aftermath. He courageously showed up to protest in defense of the Durham community; let’s show up for his family with a massive show of solidarity and care. It’s so cold outside! Let’s make sure our neighbors are warm and safe. ATTENTION ALL WORKERS IN DURHAM: SPEAK-OUT! 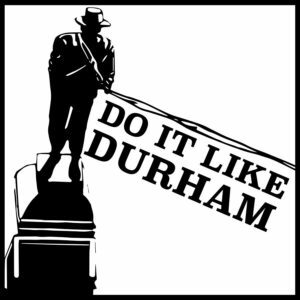 Newly-founded Durham Workers Assembly is calls on all Durham workers to speak out for better wages, job safety, an end to sexual harassment and discrimination, better job security and more union rights! 1. Empower workers to organize on their jobs. Create a venue for workers from various employers to feel comfortable reporting on their working conditions and speaking out, and receiving assistance in building workplace organization on their job. This will include regular trainings and monthly workers assemblies (first Thursday every month). 2. Establish standards and expectations for all employers, both public and private sector, inside the City of Durham such as a Workers Bill of Rights. 3. 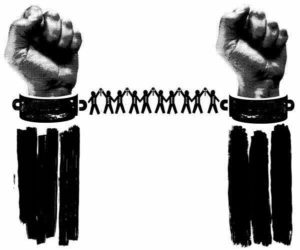 Have broad community and labor participation so that organizing campaigns and demands made by workers on their employers are supported by independent power of the people and workers. Go to Unions4Durham.org to learn more.